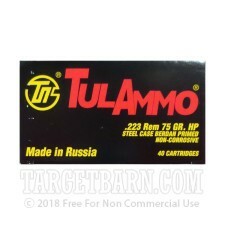 Manufactured by Tula Cartridge Works located in Tula, Russia, this 223 Rem. 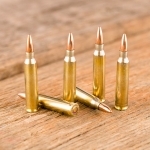 ammunition is perfect for plinking, range training, or tactical drills. 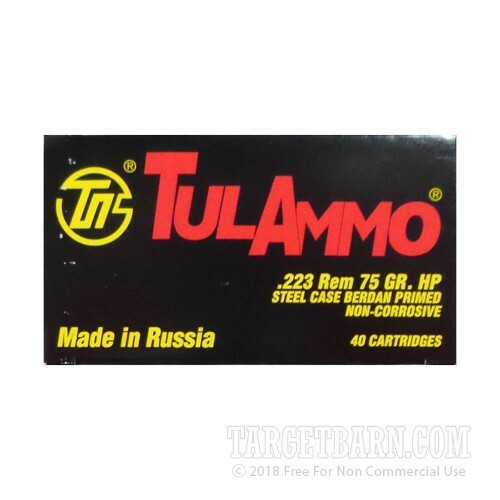 One of the largest ammo manufacturers in the world, Tula is known for producing reliable, rugged, and surprisingly affordable products. Perfect for long-term storage, these 1000 rounds are designed to maintain quality under extreme temperatures. Still firing consistently and accurately at temperatures as low as -4 degrees and as high as 122 degrees, these are rounds you can rely on no matter the shooting conditions. 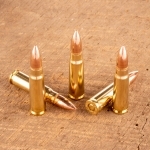 Each round features a heavy 75 grain lead hollow point (HP) projectile with a bi-metal magnetic jacket. The solid weight of these projectiles provide extra stability for accurate shot placement even at extended ranges. They are loaded in polymer-coated steel casings for reliable cycling with non-corrosive boxer primers. 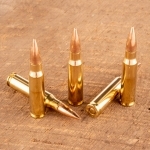 Cartridges comply with all international CIP requirements so you can shoot these rounds with peace of mind. 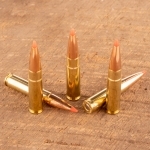 Leaving the muzzle at a velocity of 2750 feet per second with a muzzle energy of 1260 foot pounds, this .223 ammunition is suitable for small game and varmint hunting, as well as high-volume target practice.